"Thank you for the prompt turn around and most importantly, the low price of the contact lenses." 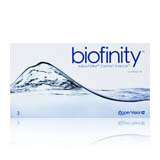 The Biofinity 3 Pack contacts by Cooper Vision are constructed from a special Aquaform material that provides the ability for oxygen to travel through the lens and reach the eye. This exchange of air will help keep the eye moist and decrease the likelihood that the eye will become irritated with long periods of contact wear. The balance of water and oxygen in these contacts prevents redness and discomfort caused by dry lenses. These are monthly contacts and can be worn continuously for thirty days. This is the best feature of these contacts, since the person wearing the lens has no need to remove it before thirty days of wear. The breathability of this lens makes it one of the most comfortable to the eye, since the air exchange makes it feel as if there is almost no lens present. The packs come with 3 contact lenses giving three months worth of contacts for each eye with the purchase of two boxes.